The Chevrolet Impala, available at Classic Chevy, was first offered for sale as a 1958 model year. This was the only year in that first generation run. The second generation lasted longer and ran from 1959 through 1960. Eventually, after the seventh generation, which ran from 1994 through 1996, the Impala was discontinued. Chevrolet brought it back in 2000 for the eighth generation. Since then, the Impala has run through two more generations: It is now on its tenth generation, which started in 2014. 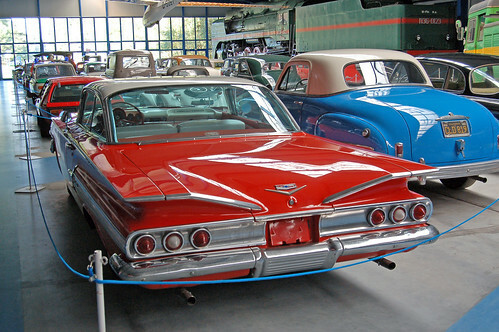 While the Impala wasn’t offered for sale until the 1958 model year, the name was in use in 1956. That specific vehicle was a full-sized vehicle built for the General Motors Motorama show. The 1956 Impala took many cues from the Corvette, including the grille. While the ’56 probably didn’t survive unless some collector is hiding it in his barn, the Impala name did. The Impala was built on an “A” body, which it shared with Pontiac. The first year, the Impala was available as a two-door hardtop or convertible and had a choice of three engine and three different transmissions, including the two-speed Powerglide. The second generation saw many changes. The Impala had five different models: a two-door convertible, coupe and hardtop; and a four-door hardtop and sedan. It offered three different engines and five different transmissions, including a new Turboglide automatic. Chevrolet kept up with the times, changing the body style and available engines and transmission throughout the years. The seventh generation, which ran from 1994 through 1996, gave consumers a four-door sedan on the “B” body platform. It featured a 5.7-liter LT1 V-8 (small block 350) and a 4L60-E automatic four-speed transmission. The 1996 Impala – the last year this model was available until it was resurrected in 2000 – got body-colored trim, a new unique grille, 17-inch brushed aluminum wheels, and more. After 1996, all “B” body cars – the Caprice, Impala SS and Buick Roadmaster – were discontinued. Chevrolet decided to bring the Impala back. The eighth generation of this iconic vehicle ran from 2000 through 2005. It was offered as a four-door sedan built on the “W” body, and it featured a front-wheel driver powertrain. Consumers had a choice of three different engines and two different four-speed automatic transmissions. The current tenth generation went into production in 2013. This generation also features only the four-door sedan. While the 2015 model year is not yet available at Classic Chevrolet, keep your eye on it – it is expected to be a bi-fuel model. It will run on gas or compressed natural gas and is expected to go up to 500 miles on one fill-up. Stop by our dealership or keep an eye on this space for more information on the 2015 model year as it becomes available.